Although there are plenty of kettles on the market that don't whistle, that telltale sound is often desired by shoppers. I love the slightly retro whistle that lets me know my tea is done, but I also appreciate its more practical benefits. 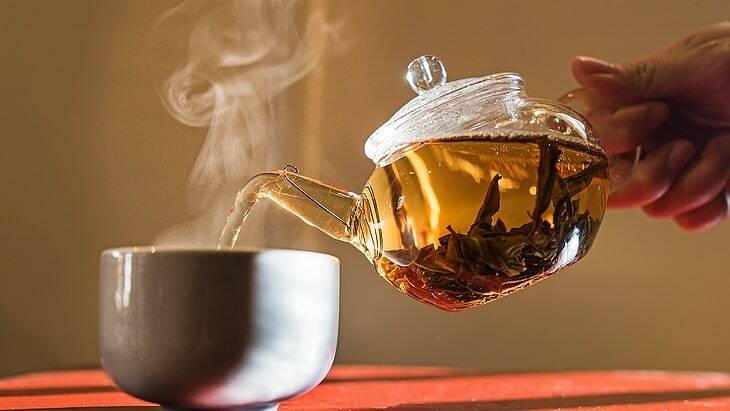 Whether you're a frequent tea drinker or you need to boil water for your broth or enjoy instant soup, this guide can help you find the best whistling tea kettle on the market. 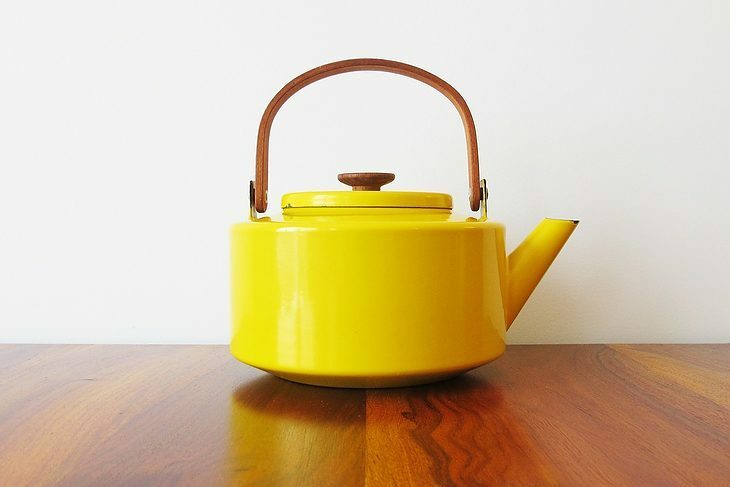 If you're not really into retro whistle of tea kettles and just want to pick the best kettle for your gas stove, I have 5 Best Tea Kettles For Your Gas Stove for you . For many people, the sound of a whistling tea kettle is a pleasant reminder that the water is boiling and it is time to make their beverage. However, it is important to realize that the whistling sound isn't just for fun. That whistle lets you know that the water is at a rapid boil, which also means that evaporation is happening quickly. Depending on the size of your kettle, a few minutes of whistling can signal that the kettle has boiled dry and might be damaged. That's why people who opt for stovetop tea kettles should also opt for the nostalgic whistling function to protect their kettle. There are 2 popular types of whistling tea kettles: electric and stovetop. Making decision to choose which type depends mostly on you. If you're the one who follow the retro style then stovetop kettles is the right choice for you as it all reminds us about these good old days. Stovetop tea kettles generally only work when placed on a source of heat, typically the burner of a stove, and they almost always whistle to prevent a dry boil from happening and ruining the kettle itself. On the other hand, if you own a modern lifestyle or care about saving money, energy and the planet then you should stick with the electric tea kettles since they are more energy efficient. Plus, they boils water faster, really save your time. An electric kettle doesn't require an external source of heat, you just need to plug it in to heat water. Although many electric tea kettles don't have a whistling function, some still have it simply because users find the sound to be a useful reminder. As you shop around for the best whistling tea kettle, think carefully about how much water you will need to boil at a time. A single person who only drinks the occasional mug of tea, for instance, can get away with a smaller tea kettle that only boils a few cups (2-4 cups) of water at a time. If you have a large family who all want hot water for various beverages at once, then choosing a larger tea kettle will be a priority. Keep in mind that if you buy a whistling tea kettle that holds more water, it will take longer to boil and may not be as convenient for your family. Once you hear the whistle of your tea kettle, you will need to pick it up and pour hot water into the cup, mug or bowl of your choice. If you're dealing with a clunky or very heavy tea kettle that's full of water, even the simple act of pouring can be challenging. An easy-to-pour tea kettle is more than just a convenience, however, since one that is hard to pour could result in you spilling boiling water or even burning yourself in the process. Ease of use is helpful for safety in the kitchen. Even after the water has come to a complete boil, most electric whistling tea kettles will still be cool enough that you can touch the handles as well as the sides with ease. This makes them ideal for seniors as well as older children or teens. 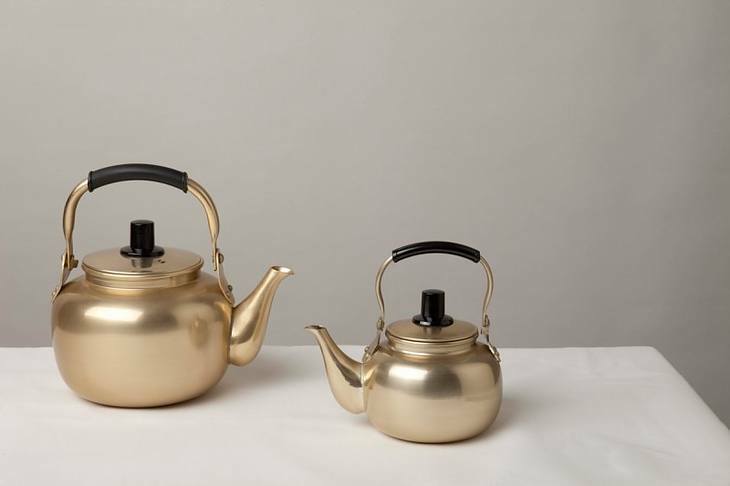 Some whistling stovetop tea kettles can be hot to the touch on the exterior of the kettle, but double-walled versions tend to be merely warm rather than scalding. No matter how stylish or decorative a whistling tea kettle might be, it should still have an opening large enough to stick your entire hand in. This ensures that the tea kettle will be easy to clean as well as dry in between uses. 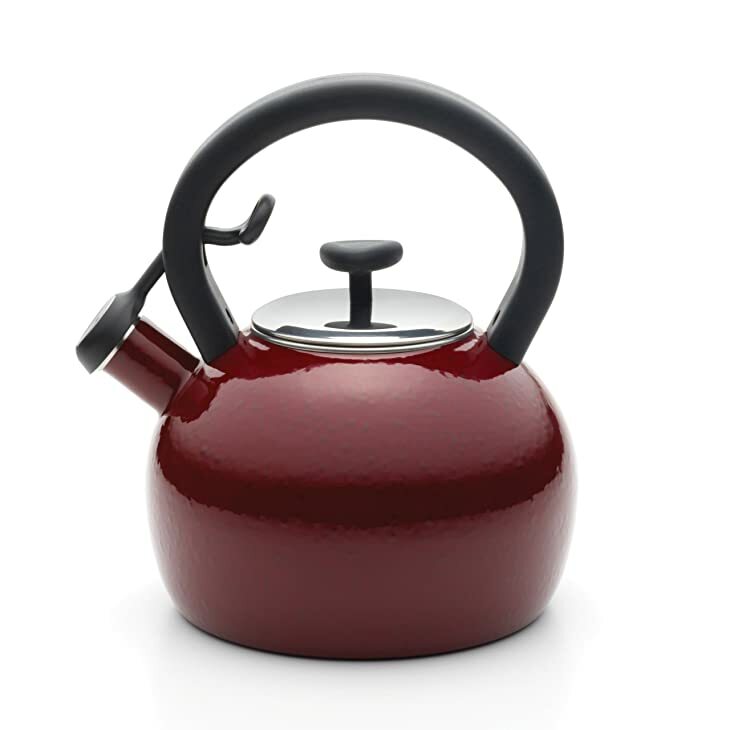 If the tea kettle has a small opening with a tiny lid, it means that you'll likely have to use a special cleaning implement to get inside and clean it. 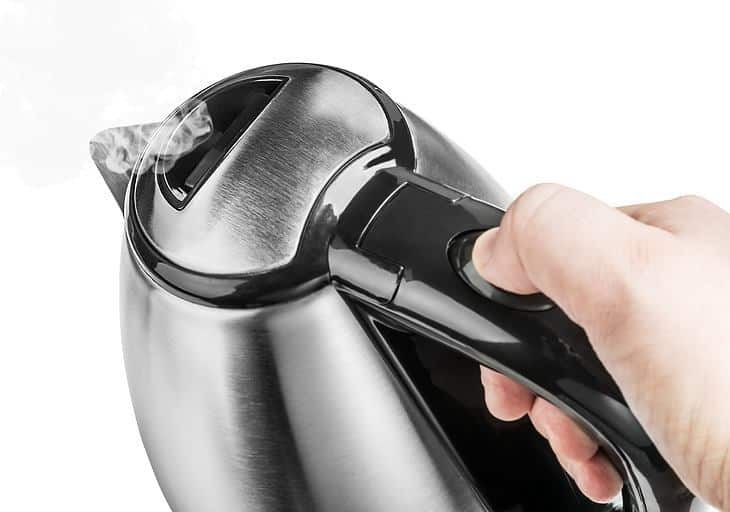 Save yourself the hassle and choose a kettle with a larger lid for easy cleanup between uses, or learn more tips at The Simplest Way To Deep Clean Your Kettle. The Takei Tk-250 Quickone Energy-Saving Fuefuki Whistle Kettle is a sleek, stainless steel and very modern appliance that boasts a mirror finish. Although it is crafted from a durable material, it is still lightweight, which I appreciated when it was full and I needed to pour the boiling water. 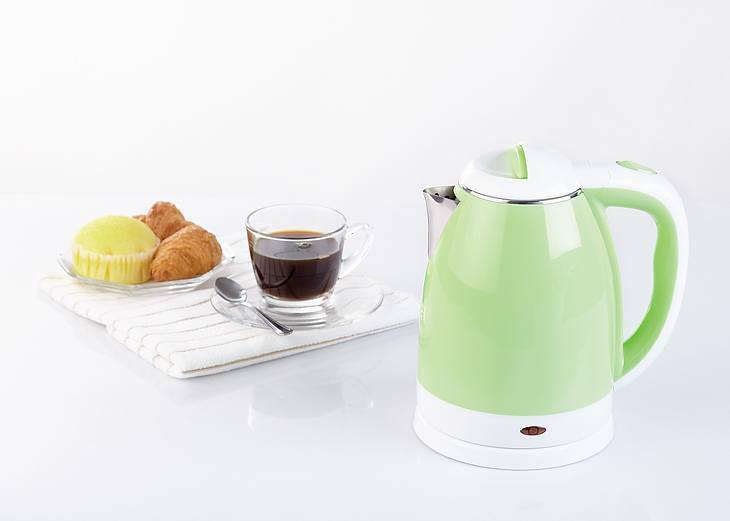 This Takei kettle is used widely in the hospitality industry in Japan, so it is designed to last through thousands of uses with ease. The hole for the lid is just wide enough to fit a hand in for cleaning but not so large that it is a risk for bubbling over. As a bonus, the contemporary kettle is induction-ready, which means that it will work on virtually every kind of stovetop out there. This lightweight model weighs under 2 pounds. The main material is durable and reduces the potential for rusting. It holds up to 2.5 liters of water. The kettle works on gas, ceramic or induction cooktops. It heats water very quickly. Instructions for the kettle come in Japanese. The fill line is faint and may be difficult to read. 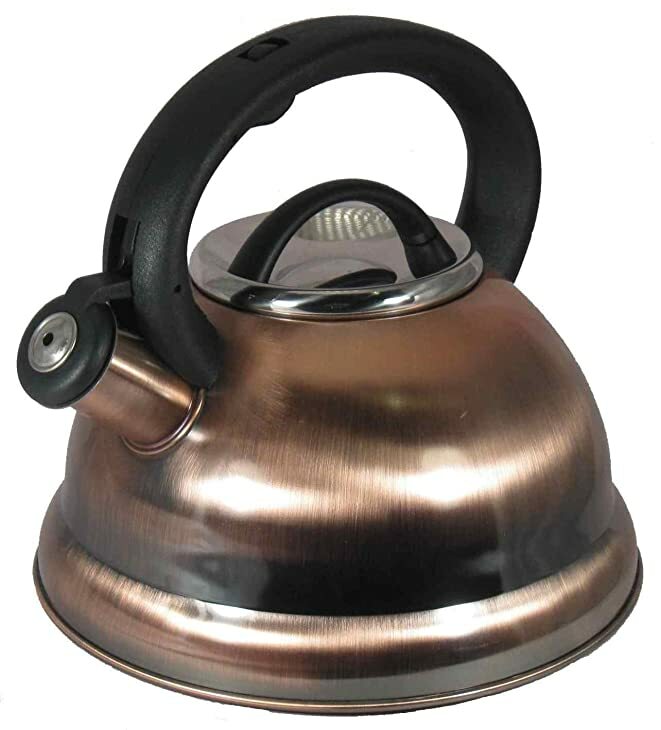 At first glance, the Alpine Copper Finish Encapsulated 18/10 Stainless Steel Whistling Tea Kettle is attractive and appealing. Taking a closer look, I could see that the copper was just a finish. The stainless steel base was a nice hidden touch to speed up the speed of water boiling, but the lid was also stainless steel and looked a bit strange with a copper-colored kettle and black features. One feature I particularly enjoyed about this whistling tea kettle was that the spout automatically locked in place, which means that there is far less steam that can rise and burn your hands when you're lifting the kettle or pouring out hot water. Thick stainless steel makes it durable. The copper finish on the exterior is elegant and attractive. There is a very large lid opening for super easy cleaning. The trigger on the handle makes it easy to open the whistling spout. Copper is just a finish, not the main material. The stainless steel lid clashes with black handle and copper kettle. The capacity of nearly 3 quarts may be too big for a single user or couple. 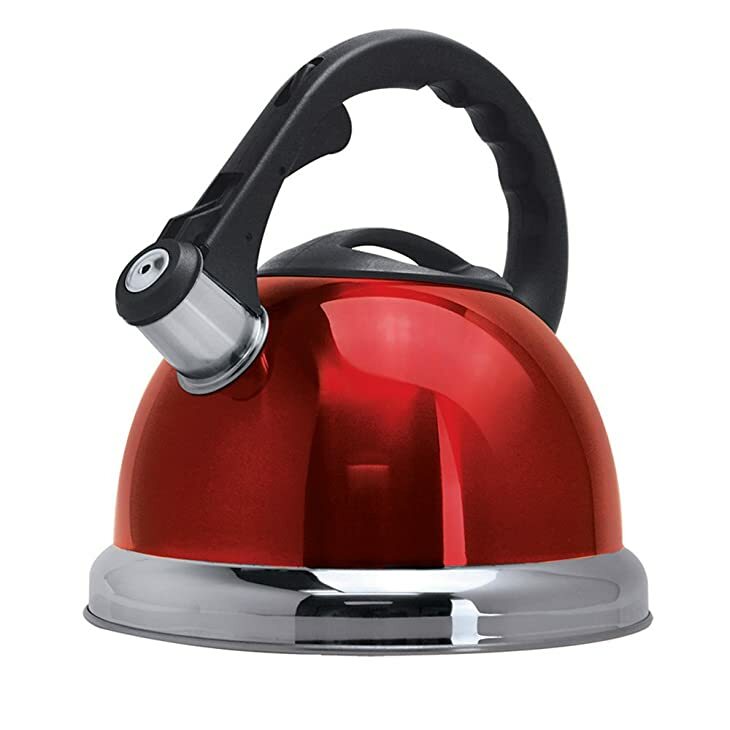 The Primula Safe-T Whistling Tea Kettle won me over right away with its bright red color, but that modern, bold look won't necessarily fit the decor of all kitchens. This oversized kettle can hold 3 quarts, and it even has an extra-wide base to speed up the boiling. While that can be an advantage, the large size also means it is a heavy kettle that’s not as convenient to use and store as other models. The handle is a definite plus thanks to an ergonomic design and the fact that it is deliberately angled away from where the steam rises from the kettle. At its slightly higher-than-average price point, however, this whistling tea kettle isn't my number one pick. The wide steel base helps water boil faster. It features a roomy, 3-quart capacity. The trigger spout makes it easy to pour water. A wide-mouth lid makes cleaning very easy in between uses. It has a relatively high price point compared to similar kettles. The mirror-polished red exterior may not complement all kitchen styles. The wide base and large capacity mean a heavier kettle overall. The Paula Deen Signature 2-Quart Whistling Kettle in Red Speckle is a beautiful addition to a home with a rustic or country style. However, it may look out of place in a more modern or contemporary home. The capacity of 2 quarts makes it the perfect size for a typical user or couple, and the enamel coating over porcelain means you'll never have to worry about rusting. One of the drawbacks to the kettle is that the enamel can chip off over time, making it less that appealing for anyone who anticipates frequent usage. The porcelain and enamel combination also means the kettle itself is heavy, particularly when full, which can make it a challenge to lift, maneuver and pour with ease. The lid slots in perfectly to prevent the steam from burning your hand. The kettle's rustic style works perfectly in a country kitchen. The capacity of 2 quarts is perfect for most people. An enamel coating makes the kettle easy to keep clean. Enameling makes the kettle heavy to lift when full. The kettle can't be used on a glass cook top. The paint can easily chip and peel off the exterior. The Kate Kitchen Sense 3.2 Quart Stainless Steel Whistling Tea Kettle is a contemporary kettle that combines the whimsical whistle with a modern look. One of the best things about this kettle is that there has clearly been a lot of attention placed on making elements of it heat resistant. Even with a few cups of boiling water inside, I could easily touch the handles and the lid without risking burned fingers. 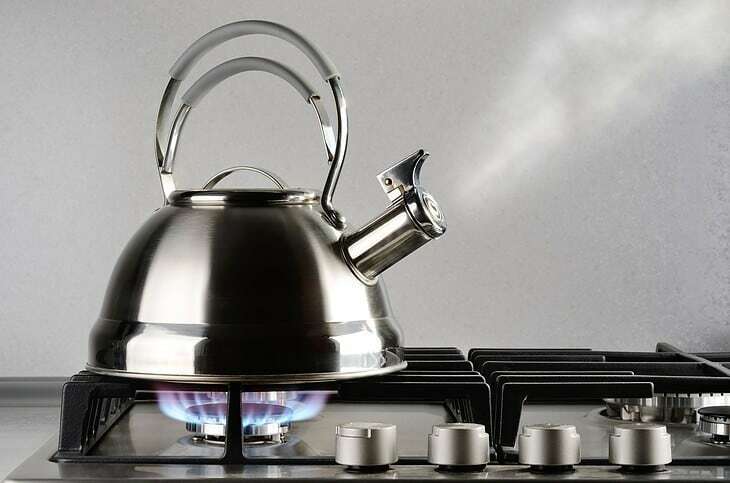 Although the larger capacity of the kettle might be a plus, it takes well over 10 minutes to boil water when filled to capacity, which may be too long for some users. The kettle is available in stainless steel paired with black, blue or pink, but the design looks less upscale than similar kettles made entirely from stainless steel. The kettle can hold 3 liters of water at once. Its handles and thumb rest are completely resistant to heat. The wide, screw-in lid means it is a breeze to keep clean. 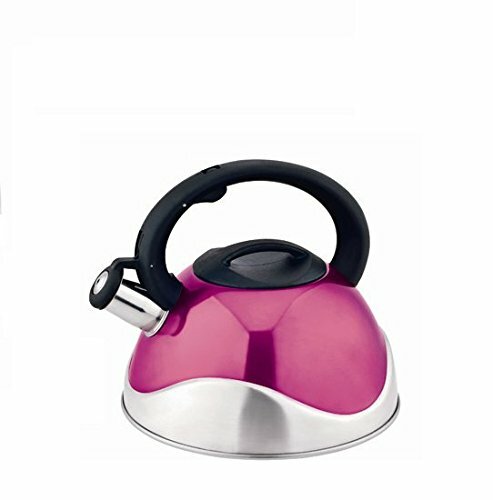 The kettle is available with pink, black or blue details. The whistle spout can get stuck, making pouring difficult. Its large size means boiling water can take more time. The whistling sound can be too quiet to hear if you're not close to the stove. Of these five incredible whistling tea kettles, the clear winner is the Takei Quickone Energy-saving Fuefuki Whistle Kettle. It is the perfect compromise between too large and too small. The sleek stainless steel looks great and is designed not to rust. It works well on just about any stove (including glass stove tops that aren't compatible with all kettle types). Easy to clean thanks to a large lid. The handles won't overheat and burn your hands. 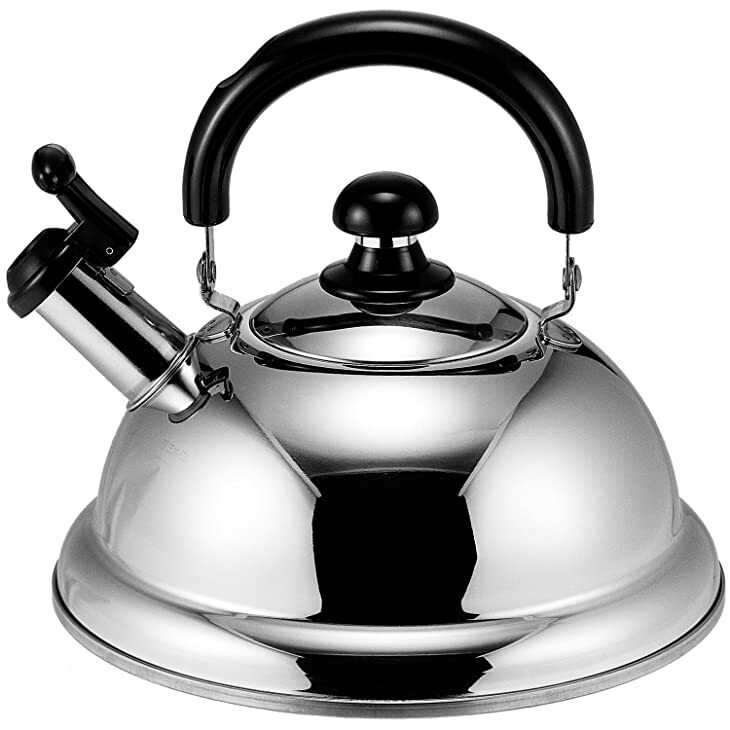 Perhaps best of all, the price of this incredible stainless steel whistling tea kettle is a very reasonable $31, making it far from the most expensive on this list despite its durability, style and efficiency. What do you think about my top picks? Let me know in the comments and share this article with a friend in search of a great tea kettle! I need a kettle that sounds through the houses. I notice that all the kettles reviewed are of the familiar type: the spout has a cap with a hole in it that gives a shrill whistle when the water boils. You did not review any of the Chinese kettles with harmonica reeds in the lid, which give a harmonic humming sound. I tried several of these but they did not sound reliably. The problem was that too much steam escapes around the lid (doesn’t fit tightly enough) and through the spout (the cap is aluminum and also does not fit tightly). The solution is to find a cylindrical cap that fits over the spout and devise some way to weigh the lid down (if it is steel, a magnet will do, but if it is aluminum you may have to bend the edges out a bit to make it fit better). The one I now have is quite audible at the other end of the house, and the sound is, in my ears at least, more pleasant than the whistle made by directing the steam through a small hole at the end of the spout.